The Flash deals with last week’s reveal as Cisco comes up with a radical plan to take away Savitar’s advantage. With so few episodes left in the season it seems somewhat baffling that there would be what essentially amounts to a filler episode. All that was accomplished here in a broad sense was getting the team back to where they started. Temporary amnesia is a badly overused trope in pretty much any kind of fiction but it can be fun to see a character wander around clueless for an episode. This episode actually numbers among the best of season 3 because it does let the show stray into a lighter tone. The plan to stop Barry creating long term memories until they can figure out a way to stop Savitar is fairly ridiculous as plans go but it does make for some affirmative action on the part of Team Flash. They have a problem and come with a radical solution to it. Obviously it won’t work because Savitar being defeated by not knowing what’s going on wouldn’t number among the best villain downfalls. I’m also not sure why they couldn’t just make plans and not tell Barry about them to keep them from Savitar. Naturally it goes horribly wrong and Barry loses all of his memories right down to his name. It’s silly for sure and on the whole I was reminded of the happier days of season 1 where the tone was far more optimistic and there was no unnecessary grit. This is the episode that I didn’t know I needed and I hope it heralds a much lighter tone going into next season. Amnesiac Barry isn’t really the focus of this episode. It provides much more of a showcase for Iris who so often feels like set dressing rather than an actual character. This is the first example of her having something meaningful to do in quite a while. Her main job is to babysit Barry but at least we gain some insight into their relationship and their history as she sees it. There’s still a persistent problem of Iris being defined by her relationships to other people but at least she has something to do for once. It might be baby steps towards rehabilitating her as a character there is some movement. The scenes between Barry and Iris are great to watch. It’s great to see them almost acting like a couple who do fairly mundane things that tell us something about them. Sitting in Jitters looking at old photos to help Barry get a sense of what his life was like isn’t exciting or dramatic but it’s a solid character beat that allows the actors to do the heavy lifting to get us to invest in the scene. The back and forth is endearing and it’s probably the first time I’ve felt invested in Barry and Iris as a couple. When they’re given scenes like this they definitely work so it makes it all the more infuriating that their relationship is defined by angst, tragedy and melodrama. Maybe this is a sign of things to come or it could be a fluke. Iris also has difficult choices to make throughout the episode. She is faced with a version of Barry who is free of all the pain and loss he has experienced in his life and it’s something she likes to see. Essentially she is able to relieve him of his burden so being honest with him about the circumstances of the death of his parents is difficult. Finding that out for the first time all over again will be difficult and it’s not easy for her to be the one to tell him. Initially she embellishes the truth by trying to reassure him with the false knowledge that their deaths were peaceful. Whether you agree with her choice or not it’s clear why she made it. She clearly considers letting Barry stay that way because he is free from everything that was weighing him down and the ethical implications of this are addressed slightly. Joe believes that Barry without his memories isn’t Barry at all so restoring them is a necessity rather than a choice but Iris likes seeing him happy and doesn’t want to take that away from him. There’s a little of the nature vs. nurture debate in here as Barry seems to be naturally an upbeat person who has been affected by all of the negative experiences in his life. Iris is being somewhat selfish in one way as she doesn’t want to be the one to remind Barry of all of his bad experiences. She’s looking out for him but also trying to absolve herself from inflicting pain on Barry again. When really tested she makes the right choice to benefit a lot of people. 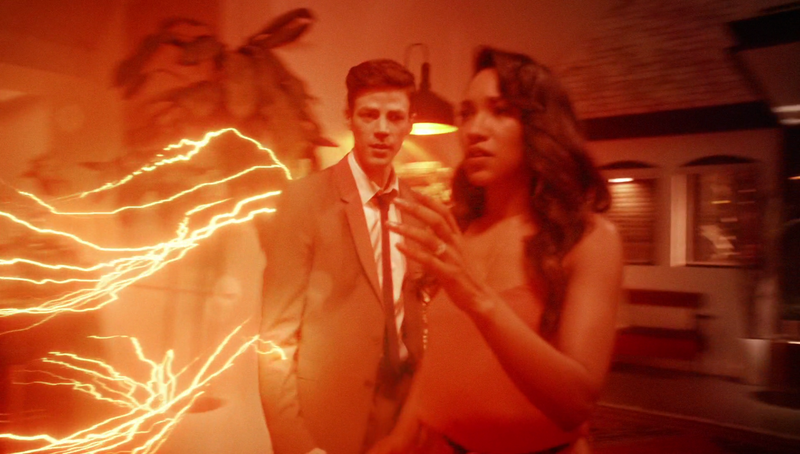 The Flash is no use as a hero without his experience or confidence and Iris is the one to encourage him to remember. Her chosen reminder is a really cheesy one punctuated by her telling him that it’s the night they fell in love as it most likely isn’t but the fact that she recognises that Barry needs to be the man that has been shaped by his experiences is a major step forward for her and it’s a moment that feels earned. Barry was a lot of fun in this episode. It’s refreshing to see him so cheery and optimistic and some of the memory loss gags worked really well. Deciding to go by Bart was a nice nod to Bart Allen and the scene in the courthouse where he was reading his testimony using Smart Glasses was entertaining. I really hope that Barry manages to get back to some level of optimism fairly soon. The callback to his time in Flashpoint made a lot of sense given the circumstances. Despite all of the pain and heartache he has endured there is a lot about his life that he likes. He mentions that he doesn’t want to forget all of the positive relationships he has forged and tells Iris that he fixed Flashpoint for that very reason. It’s a complete retcon but at least Barry can appreciate all the good he has in his life. Cisco and Julian’s work to restore Barry’s memory provides an opportunity for Caitlin to interact with them. Her reason for being there makes sense as she wants to restore Savitar’s memories to give herself a sense of purpose and the episode does a good job building a tense dynamic between them. Cisco tries to take advantage of Caitlin being around by reminding her of better times. He tells a story involving Ronnie to provoke an emotional reaction and it is definitely starting to work but Caitlin is pretty far gone at this point. This pays off further when she is offered the chance to stay so that Julian can find a cure. His promise to “try harder” doesn’t exactly inspire confidence but the sentiment is right. Telling Julian that she never loved him or the rest of the team is pretty brutal but the implication is that she is definitely exaggerating in order to make it easier for herself. The quick shot of her eyes changing shows that and I find it interesting that the conflict has flipped from Caitlin trying to suppress Killer Frost to Killer Frost trying to suppress Caitlin. I wouldn’t be surprised if she makes a significant choice in the finale. Meanwhile, on what feels like a different show; Tracy is still working on her invention that can trap Savitar while she and H.R. flirt with one another. These scenes are tedious and I don’t quite buy that Tracy could go from having crackpot theories last week to finishing her invention this week. I also don’t really buy into the Tracy/H.R. romance. Everything about Tracy feels too sudden especially since we are two episodes from the finale. There is an attempt to explain the origin of Savitar but it goes by so quickly that it lacks death. It also makes very litte sense as the lack of cohesive continuity really lets it down. 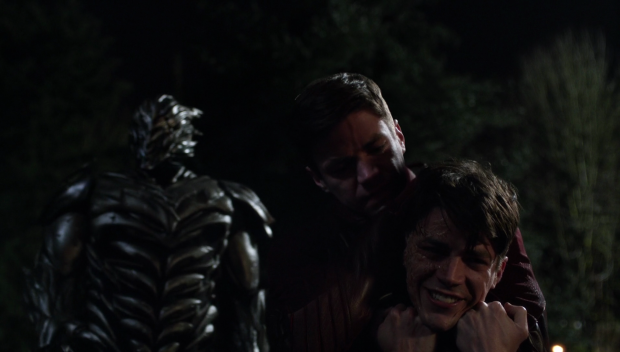 Savitar is apparently one of Barry’s time remnants that was mentioned back in “The Once and Future Flash” created because of the loss that Barry suffered. This time remnant feels lost and forgotten aasa he was created as a disposable copy of the original. This causes him to go truly insane and start the Speedster God myth by creating a time loop that allows him to be created in the first place. 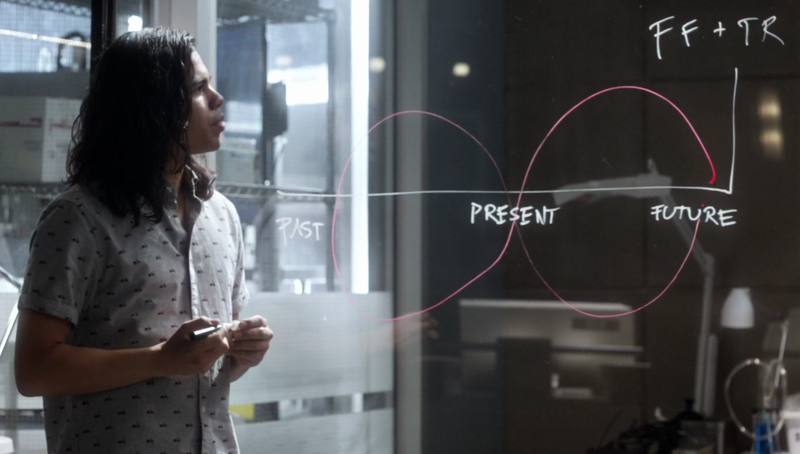 It’s very confusing and poorly explained no matter how many boards Cisco draws on. Time Remnants are a bizarre concept because of how they have been used in the past. In the season 2 finale Barry learned how to create one pretty much out of nowhere and the implications were dismissed pretty much right away. Savitar being a copy of Barry rather than a future version of the original also largely robs the reveal of a lot of its drama since it isn’t actually Barry that becomes Savitar, it’s a forgotten copy of him. This also further confuses the continuity from Barry’s trip to the future as his future self didn’t know who Savitar is. The only way this works is if future Barry was lying which I don’t believe to be the case as he had no reason to. This episode does establish that memories and events are changed in real time as Barry’s memory loss immediately affects Savitar as well. Why he doesn’t simply wink out of existence is beyond me and why Wally remembers having super speed is another issue. The top level problem is that this show hasn’t decided what the rules are so every explanation sounds like nonsense. I found Savitar’s line about the rules not applying the more someone time travels to be hilarious on a meta level as it could be argued that the lack of consistency is what drove the copy of Barry insane. That would actually be an interesting twist that would be better than anything we’ve been given so far. At least the possibility of killing himself comes up but there’s nothing definitive on that. Savitar killing Iris so that he can exist in the first place fuelled by the loss and anger associated with that loss is something that just doesn’t work because of how poorly explained it is. I think the best explanation that we have to go with is that Savitar remembers the events precisely because his memories are changed as soon as Barry experiences the events that create them. Effectively the future is changing but Savitar continues to remember whatever Barry experiences so he can’t really do anything but react to events that will allow him to remember whatever the counter measure is. It’s complicated and confusing but basically the loop keeps changing while still being a loop. How this will be resolved is anyone’s guess but I don’t think it’ll be satisfying. A fairly disposable episode but actually a lot of fun to watch. Temporary amnesia is an overused trope in fiction but it does allow the show to have some fun with Barry being clueless about his own life. This is a great opportunity for Iris to do something other than act as glorified set dressing. She is still defined by her relationships to other people but at least she has something meaningful to do. The scenes between Barry and Iris showing them doing mundane things like looking at photos do a lot to make the relationship feel worth investing in and Iris wrestling with the choice to leave Barry the way he is and let him be free of the burden of remembering the pain he has experienced or restoring his painful memories plays out well. Barry is a lot of fun this episode with several amusing gags created by his lack of memory. Caitlin working with Julian and Cisco to restore Barry -and by extension Savitar’s- memories is a really compelling and tense dynamic. Cisco trying to appeal to Caitlin using a story about Ronnie makes sense and seeing Caitlin fighting to suppress her old self is really well handled. The Savitar reveal still doesn’t make a lot of sense and adding in the poorly developed Time Remnant element just makes things worse.